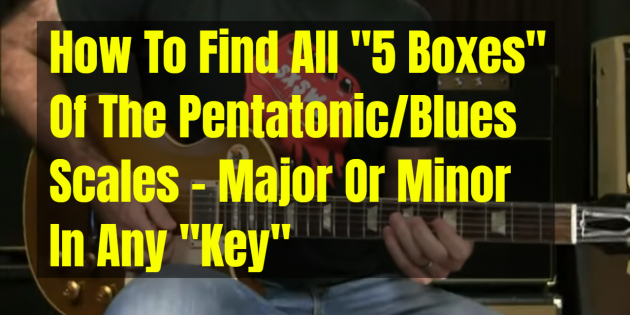 Certainly in people that I work with every day, wrapping your head around “the boxes” and being able to truly find all of the possible places to play your pentatonic/blues minor and major scales can be a challenge. I’ve done videos on “the boxes” in the past, so I won’t spend a whole lot of time on them here, but hopefully I can give you some ways to practice that will help with seeing them on your guitar better. Hope you dig the video! You hit the nail on the head! I was racking my brain out wondering how Guitar players can jump around the fret board & play any box! The five positions of the root note give’s the baseline to know what box to play in each postion. Griff I don’t watch all your daily videos, but this one really got my attention. Great information! Another amazing video lesson! Turned on the high beams to see much further up the road. Good explanation and examples. I enjoyed your adding info about using box 2 with your middle finger. I’m slowly understanding this theory with getting my muscle memory learning too. i stil ave this video. Just the Otr day, i was going trough my sheet tabs and lyirics for songs i play live. found the old 5 box’s. i know them al, and i knw they whre the same notes. i really just like playing box 1 and 2. unless i’m soloing a pink flyd sond, that use box5 and 6. thanks for what you do griff. Fretboard or down the fret board . There are basically only those two options up or down or “right facing or left facing” and now all I had to do was navigate going across from the G string to the B string . This has givin me one extra way to see the boxes . Great Video, great info as usual! How do you decide when to you use the Major scale or minor scale? If not playing blues, should I be using the major scale to start my solo? If it’s not blues, you have to figure out if it’s a major or a minor key… so it’s not a simple answer. If you believe it’s a major key, go with major pentatonic. Minor pentatonic can also work, it’ll just sound “bluesy” if it’s in a major key.